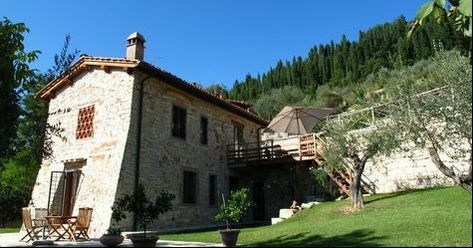 VILLA dates back to 1550. At that time it served as a barracks for guards defending Florence's territory. ​Over the centuries its use changed and it became a barn. ​Villa has its own private garden and two terraces. On the upper entry level there is an east facing deck-terrace. Just off the kitchen, this is ideal for breakfast in the morning. ​Downstairs, the sitting room opens onto the south facing garden terrace which is gorgeous all day long right up to sunset when you can watch the sun going down in the west over the vineyards. Deck terrace : east facing (perfect for morning sun). Table and four chairs for outside dining. Large umbrella. Kitchen/living room: direct access from terrace to this room. Equipped with dishwasher, fridge freezer, sink, 4 ring gas hob, electric oven. Dining table with seating for 6. Sofa. Tv, wifi. Air-conditioning and ceiling fan. ​Bathroom upstairs : tub and shower enclosure, basin, wc and bidet. Hairdryer supplied. Bedroom upstairs : double bed 160x200cm - can be prepared as two singles. Wardrobe. Air-conditioning. Sitting room : sofa, 2 armchairs, working open fireplace, corner cupboard concealing kitchenette (small fridge, electric ring and sink). Glass doors opening onto south-facing terrace and garden with views across vineyards.